Project Magic is an innovative program that uses magic as a form of therapy for people with physical, psychological, and social disabilities. Project Magic combines the talents of professionals in the entertainment field and those in the medical field to provide a quality of therapeutic training for patients far ahead of traditional rehabilitative programs and techniques. Patients involved with this fun, stimulating activity experience enhanced motivation. As a person with a disability learns the mechanics of a magical illusion, they are motivated to increase physical dexterity, functional skills, and communication. Additionally, the learning of a magical illusion can aid in the improvement of problem-solving, the ability to work with numbers, and other cognitive skills. to perform simple magic allows them to do something that others cannot. Performing magic involves knowing something that the audience does not know - the secret. The performer can work "miracles." This baffles the spectator and creates within the performer a sense of accomplishment, pride, and self-fulfillment. Self-esteem and motivation are essential to the achievement of rehabilitation goals. 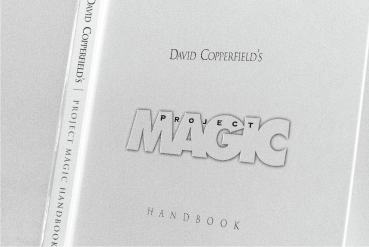 Project Magic was developed by David Copperfield, the world renowned magician, as a result of repeated letters he received from an aspiring magician. Judging from the handwriting, David believed the magician to be an elementary school student. Soon after, David learned that the "grade schooler" was actually a young man in his twenties who lived life in a wheelchair. The childlike handwriting was a result of his disability. Using the art of magic, this young man had more abilities - not less abilities - than the average person. With that realization, David thought of a way to inspire, reach, and help other people with disabilities. That way was Project Magic. David, along with Julie DeJean, O.T.R., organized Project Magic in 1981 as an innovative way to help individuals with disabilities during their therapy process. In 1982, the American Occupational Therapy Association (AOTA) formally endorsed Project Magic. "[Project Magic] has provided motivation, enhanced self-esteem, and increased hope while contributing an alternative approach for therapeutic gains to thousands..."
Project Magic has since been developed, implemented, and guided to international status. Project Magic programs have been established in nearly every state in the USA, and 30 foreign countries. It has provided motivation, enhanced self-esteem, and increased hope while contributing an alternative approach for therapeutic gains to thousands of individuals of all ages. The magician interlocks his fingers and reaches up to his shirt pocket, in which sits a pencil. With his thumbs, he pulls the pencil out of his pocket, holding it behind his hands. Then, he moves his thumbs away from the pencil and it remains magically suspended behind his hands. Suddenly, the pencil begins to dance, jumping from side to side behind his fingers. When it stops moving, he once again grasps it with his thumbs and replaces it in this pocket. The magician ties a knot in a handkerchief - and then it vanishes! You'll need a handkerchief measuring at least 18" square. The magician asks someone in the audience to pick a card. After everyone has seen the card except the performer, the card is lost in the deck. After rubbing his finger on his arm to generate static electricity, the magician holds his finger above the deck and chose card mysteriously rises. Improvement of cognitive skills - planning, sequencing and memory. The magician slips a rubber band around the first and second fingers of his hand. With a slight wave of the hand, the rubber band jumps through flesh and bone onto the third and pinky fingers. Endurance - can be enhanced by repetition of the trick. Gross motor patterns of grasp and release - including increased range of motion and finger extension strengthening. Cognitive planning and sequencing skill building. 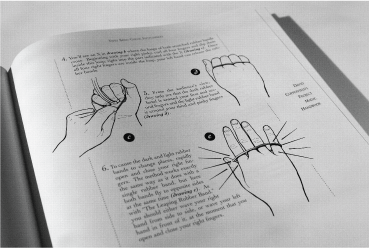 A pencil is gripped on a fist with one hand, while the other hand grips your wrist tightly, to ensure no cheating is possible. Impossibly, the magician opens his fist finger by finger, and yet the pneicl stays stuck to the magician's palm. The magician closes his fingers around the pencil again, and the pencil can be removed and inspected by the spectator. Gross motor skills - improvement of gross hand function, bilateral hand use and crossing of midline. Improvement of body awareness and proprioception. Improvement of cognitive sequencing and planning. The magician allows a helper from the audience to examine a paper ring to make sure that there are no breaks in it. Then, he threads the ring onto a piece of string, and he gives both ends of the string to the helper to hold. A handkerchief is placed over the ring. The magician places his hands under the handkerchief and a moment later brings out the ring, free from the string! Enhanced communication and self-expression skills. Improved bilateral fine and gross motor coordination. Performers with tactile sensory loss on either hand may benefit therapeutically through sensory stimulation or by learning compensatory techniques. The magician brings out a handkerchief and unfolds it to display a toothpick resting in the center. He folds up the cloth again with the toothpick inside. Then, he locates the toothpick through the material and asks a helper to hold the toothpick through the cloth. The magician says that no matter how hard the helper tried, he will now be able to break the toothpick. The magician tells him to go ahead and try to break it. "CRACK" - the helper snaps the toothpick in half instantly. "Whoops", says the magician, "Let's try a little magic to fix it." He incites an ancient Egyptian immortality spell, and then he opens the booth to reveal that the toothpick has been restored. The magician writes down a prediction on a piece of paper and leaves it in full view. The magician next asks a person in the audience to whom he has given a pad and paper, to think of any number. He tells the person to then multiply, add, and divide his original number by certain other magical numbers. The magician is able to magically divine the result of these calculations. Communication skill development - providing clear instructions regarding mathematical concepts. The magician selects a volunteer from the audience and each of them holds an identical piece of rope. The magician says that he will perform the impossible - tying a knot in the rope without letting go of the ends. A piece of rope has been given to the volunteer so that he or she may follow along. True to his word, the magician ties a knot without letting go of either end of the rope, while the volunteer cannot duplicate the feat. Improved cognitive skill in memory, planning, and sequencing. Increased range of motion, bilateral motor coordination and crossing of midline. Improved sensory motor skill in motor planning, visual perception, and spatial relations. Motivation to learn or participate. Socialization and facilitation of group interaction. Enhanced communication skills - syntax and speech intelligibility. The magician borrows a dollar bill from someone in the audience. He folds the bill and places a paper clip on it. Then, he slides a rubber band around the bill. Finally, he places the second paper clip on the bill. The magician snaps the bill and the paperclips leap off, attach themselves to one another, and end dangling from the rubber band which surrounds the center of the bill. Improved skill in planning and sequencing. Improved sensory-motor skill in visual-spatial relations and visual-motor integration. The magician borrows a dollar bill from someone in the audience. He folds the bill and places two paper clips on it, one of which has a rubber band attached to it. A helper from the audience is asked to hold onto one end of the rubber band. The paperclips are obviously not near one another on the bill. The magician snaps the bill and the paper clips leap off, attach themselves to one another, and end dangling from the rubber band held by the volunteer. Improved cognitive skill in planning and sequencing. Increased fine motor coordination and control. The magician borrows a dollar bill from someone in the audience. He folds the bill and places two paperclips on it. The paper clips are obviously not near one another on the bill. 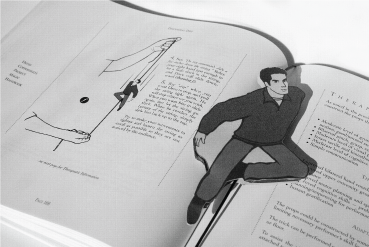 The magician snaps the bill and the paperclips leap off and attach themselves to each other. Join us and help spread awareness of Project Magic around the world. With your help, we can continue to make a difference in the lives of thousands of patients, young and old. Contact our team for all inquiries, or order an official Project Magic Handbook to get started. The Project Magic Handbook contains 50 magic effects and information on how to develop and implement a successful Project Magic program. Over 290 pages, this handbook offers insight on the program and complete detail on the applications and benefits of Project Magic. Please enter your shipping and billing information below. Your order has been processed. You'll receive an email shortly!